The touring exhibit “OUR BODY: The Universe Within” is in Omaha for a few months, and I was invited to tour it recently. I brought my 8-year-old so I could get his thoughts on the exhibit and gauge how other kids might react to it. Disclosure: This post is sponsored by “OUR BODY: The Universe Within.” All thoughts, opinions and typos are my own. You can see “OUR BODY: The Universe Within” in The Capitol District through Aug. 26, 2018 (with the possibility of extension). Keep reading to find out how you can win tickets! 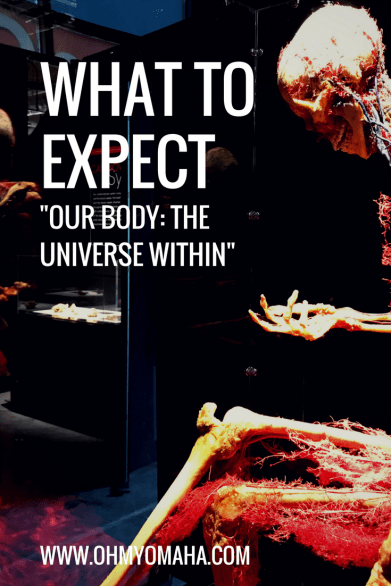 The exhibit “OUR BODY: The Universe Within” exposes the inner workings of human anatomy by presenting actual human specimens, anatomical displays, reproductions of historic anatomical artwork and much more. It’s considered appropriate for all ages. The touring exhibition, “OUR BODY: The Universe Within” includes 15 whole body specimens, like this guy playing chess. The exhibit is open in Omaha through July 31, 2018. Basically, this “BODY” exhibit is literally an inside look at the body using real human bodies. 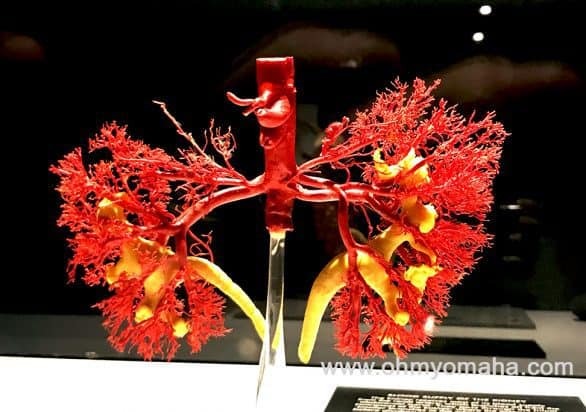 The exhibit includes approximately 15 whole body specimens and 49 display cases containing more than 110 organs and specimens. Everything in the “OUR BODY” exhibit has been preserved through a process called polymer impregnation or “plastination” – a process that replaces the body’s water and fat with reactive plastics. If you want to learn more about how they create the exhibit “OUR BODY,” read this. The exhibit includes the opportunity to touch a real liver, brain, kidney and/or heart. When we were there, we touched a diseased lung, a heart and half a brain. Due to the “plastination” process used to preserve them, they felt unreal and not all that squishy. 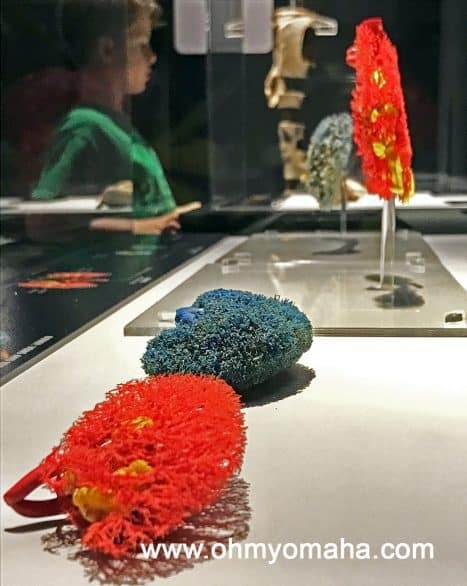 The exhibit is divided into different sections exploring the six primary systems of the human body: Musculoskeletal system, head and nervous system, respiratory system, digestive system, urinary and reproductive system, and the cardiovascular system. A look at the blood supply of the kidney. The exhibit “OUR BODY: The Universe Within” explores the six primary systems of the human body. I like that visitors are eased into the experience, starting first with something familiar to me, skeletal displays. You can probably expect some giggling if you’re bringing children. 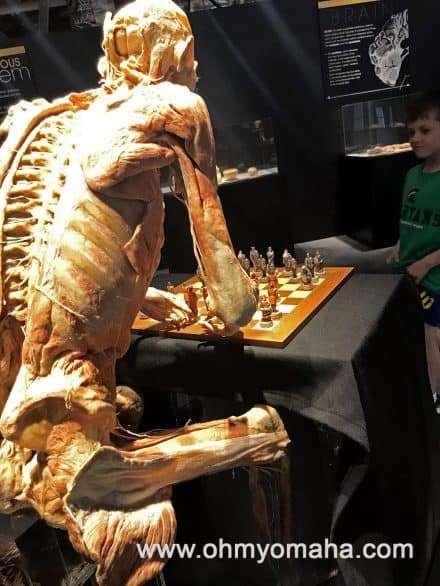 Most of the bodies in the exhibit are male, and, so, you’re going to see everything male, if you know what I mean: The male body playing basketball and the male body sitting down to a chess game, for example. I’ve been to a different touring “BODY” exhibit, and like that one, “OUT BODY” has a section with fetuses. It is separated from other areas and there are signs stating that some people may find it disturbing. There are preserved fetuses at different months of growth as well as a full-term baby. It is easy to bypass, if it makes you uncomfortable. “OUR BODY: The Universe Within,” as mentioned earlier, is appropriate for all ages, but you should be the judge on whether your child is ready for it or not. It’s wonderful for children curious about science. It can also be unsettling, though, for a child who realizes that every body on display was once a living person. “OUR BODY: The Universe Within” is considered appropriate for all ages, and there’s a downloadable guide to prep kids before their visit. When I asked my son how the exhibit effected him, he was reluctant to say. (It’s like prying teeth getting him to expand upon ideas, so this isn’t surprising) Eventually, he told me he thought it was amazing. However, I’ll add that more than once while we were there, he loudly exclaimed somethings were gross. So, that’s an 8-year-old in a nutshell. For families – This has fun facts and a very basic explanations for each area in the exhibit. I’ve been asked by friends and on social media if the exhibit is “gross.” To answer that, I guess it depends on what grosses you out. To me, it was more like a textbook brought to life. So, it was fascinating. What I found most fascinating was seeing arteries and veins of different organs. But, teeth and fingernails? Those to me are “gross” to me. As far as comfort level, I can see how this exhibit could make some people squeamish. There are some dissections that, to me, were both fascinating to examine and a little unsettling. The continuous horizontal dissection of a male body is one such dissection. Cost: Adult tickets start at $15; seniors (65+), military & family, students $12; children ages 5 to 14, $10; and Children age 4 and younger, FREE. An adult must accompany all children under the age of 12. 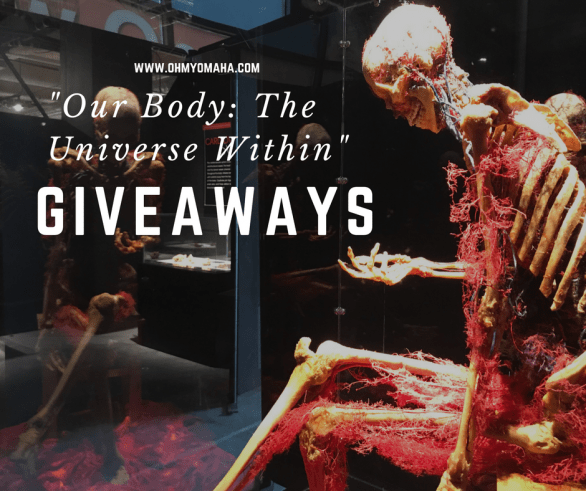 One reader is going to win FOUR passes to see “OUR BODY: The Universe Within” while it’s here in Omaha. To enter, please use the Rafflecopter form below. Must be 18 or older to enter. Passes have no cash value. Giveaway ends May 20 at 11:59 p.m. CST. Winner will be contacted via email. There are THREE more ways to win! 1. Be sure you follow Oh My! Omaha on Facebook. I’ll have a giveaway for four passes on May 20. 2. 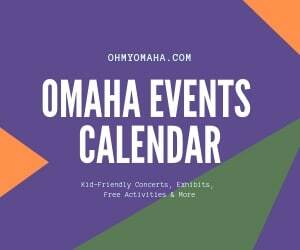 Follow Fun Things To Do In Omaha & Beyond. There’s a flash giveaway for four passes on May 7. Winner will be drawn on May 8. 3. Subscribe to Oh My! Omaha. One random subscriber will be drawn on May 20 to receive four passes. 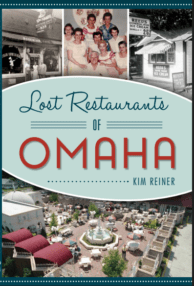 It’s FREE to subscribe, and e-newsletters are sent out twice monthly sharing things to do in Omaha, travel inspiration, and details on giveaways like this. This would be so cool to take my 6 year old son to. He’s so interested in learning new things! This sounds like an amazing exhibit! I have 2 older boys who will find this very.fascinating and 2 younger ones who would have fun but be totally grossed out! Where else can you see something like this??? An awesome way to see someone from the inside out!!! I am super excited for this exhibit!! We saw something like this in Kansas City, and it was pretty amazing. It really gives you a new perspective on your body when seeing it from the inside. I hope my 18 month old likes it! I appreciate your candidness and observations on what might make people uncomfortable. My 5-year-old is already looking at the photos! I can’t wait to check this out! Seeing the detailing of what our insides look like. I would love to visit this exhibit. I may try to touch them. It would be so fun to bring my kids to this so they could see the inside of a body! I think it would be cool to see inside real bodies, particularly brains, arteries and the veins of different organs. OMG! While this may be tough for me to stomach, my college-bound biology major would LOVE this! I think that this would be so interesting to see exactly how the human body functions. I would love to see how my kids react to this exhibit. I saw it years ago in Vegas and it was truly fascinating. My kids want to see the brains! How morbid! It would be awesome to show my kids the anatomy of our amazing bodies! The human specimens look interesting but a little creepy at the same time. Really cool — appreciating what we don’t really see. I’ve been to the Body Exhibit in other locations twice and it’s absolutely PHENOMENAL! I have my degree in Biology and I could have stayed and marveled the exhibit the entire day! I really need to take my kids though now that they are older. It’s absolutely fascinating and I highly recommend it for anyone. I’m looking forward to seeing the brain and nervous system part of the exhibit. Sounds fascinating! Can’t wait to take my kids!! My kids LOVE to learn through “real life” science museums and gardens, zoos and reenactments. They will love this! The heart exhibit will probably be the most fascinating to them! Hands on experience would be awesome—my boys would love it. I would love to see all of the different organs, nervous system, brain, etc. Sounds amazing! I have visited a similar exhibit, pre-children, and it was so neat! I can’t wait to take my son, the scientist. THANK you for the great info! I’m excited to see the heart. I think this is a very exciting exhibit to have right here in Omaha. I hope I am able to see it before it leaves our area. I would love this! I had tickets to take my daughter but because of a school activity I had to get rid of them. I can’t wait to see this! So fascinating. I think it’d be so interesting to see the blood vessels of the circulatory system!